Give the gift of PhotoThrow! Give or get an eGift Card instantly online. eGift Cards arrive by email, so there's no shipping cost! Order in bulk to reward friends, coworkers and the whole family. 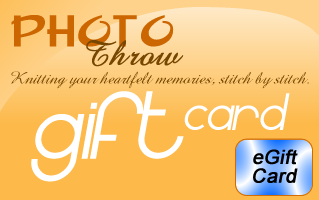 PhotoThrow eGift Cards are not returnable or refundable for cash except in states where required by law. Any refunds issued will be credited directly back to your PhotoThrow eGift Card. We will use the email address you give us only to email this item. This address will not be used for any other purpose.